In our latest game dev adventure, we were looking for a way to use our sticker app as a level editor for our upcoming puzzle app that uses the same set of assets. Our latest app allows users to pull an image from a tray at the top of the screen and resize it, rotate it, flip it and place it onto a background to build a scene. It’s basically a sticker book, or for those of you over 30, it’s like Colorforms. Our next app is a jigsaw puzzle that, upon completion, is filled with interactive characters. It also just happens to use the same backgrounds and stickers from the aforementioned project. 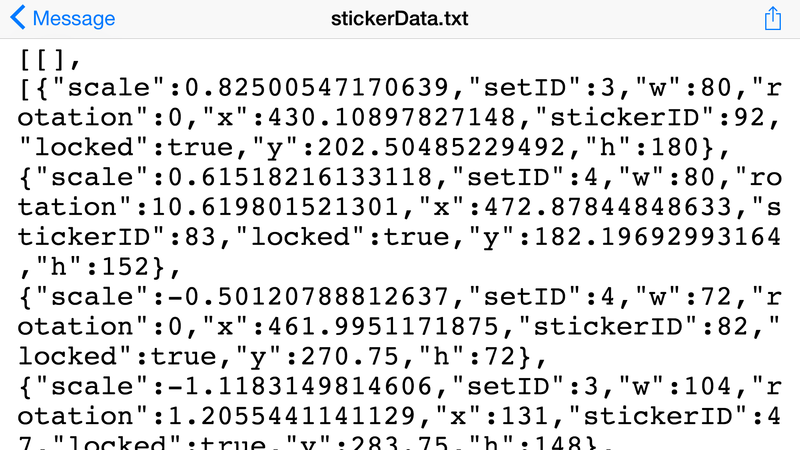 Since the sticker app saves each scene you build in a file called stickerData.txt, and the touchscreen controls work much better on an actual device than our mouse-and-keyboard app simulator, we hacked the app so that we could tap a button on the options menu to email out the stickerData.txt file from the device. Now I can position the characters anyway I want on the iPad and email that data to my partner without even touching my computer. Here’s to creative solutions *clink! In this video podcast, I discuss the ideas behind the game and the gameplay mechanics of Tappy Lander. You can see lots of gameplay in the video too. I’d love to hear your feedback! Enjoy! I love the mechanics of lander games and the fun, to me, is maneuvering your rocket through a series of subtle movements into a good position and a soft landing. It’s difficult but rewarding. 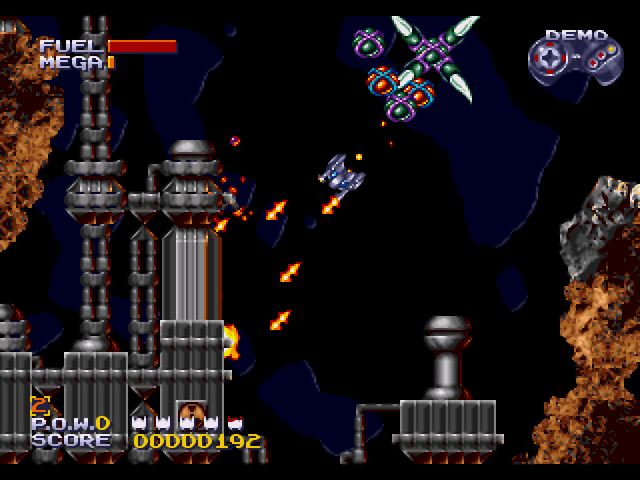 Traditionally these types of games had a variety of buttons: rotate, left, rotate right, thrust, etc. Gravity – yes, still fun after all these years! Thrusting – absolutely, compensating for a force like gravity or your last thrust, in order to change direction, is fun. Avoiding an obstacle or flying to collect an object – yes! an opportunity to test your flying skill. Landing – yes, slow down and center yourself over the target for a soft, safe landing. I immediately wanted to remove the fuel consumption issue. This is in essence, a time limit. It makes sense for quarter munching coin-ops, but doesn’t in a free mobile game. The gameplay is not made more fun by adding a time limit and removing it allows you to focus on manuvering even if you need to take your time. The prototype allowed me full control over my ship and maintained the fun of using your skill and instinct to manage the physics of flying through space. It was fun but simple; easier for general audiences to pick up and play but very challenging at the same time. …and so I moved ahead with development! The next post will be about game physics. Because I had worked out the controls before putting pencil to paper, the gameplay UI has not changed much throughout production. The center circular button has been replaced with a thumb-shaped button because the controls need to bleed off the bottom of the screen to accommodate lots of different screen sizes. Also, there is no space between or around the buttons that allow you to see the background. Although the sketch suggests this, I felt it would be distracting. The control panel must feel like it is separated from the game completely. In fact, the top of the control panel acts like the bottom of the game screen. Other than that, the final is nearly identical to the sketch. 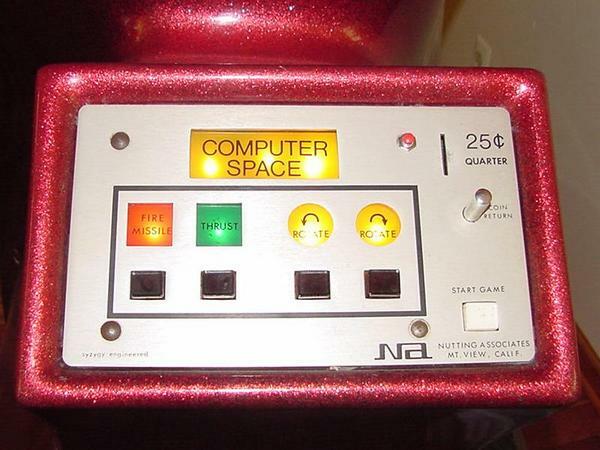 Like a classic coin-op arcade game, the control panel was to be at the bottom with the viewscreen above them. Vision-obscuring on-screen controls for touch interface games is a pet peeve of mine and this layout would ensure that no thumbs or fingers ever get in the way of the action. The touch area for the three buttons extend all the way to the top of the screen and they are as wide as possible. 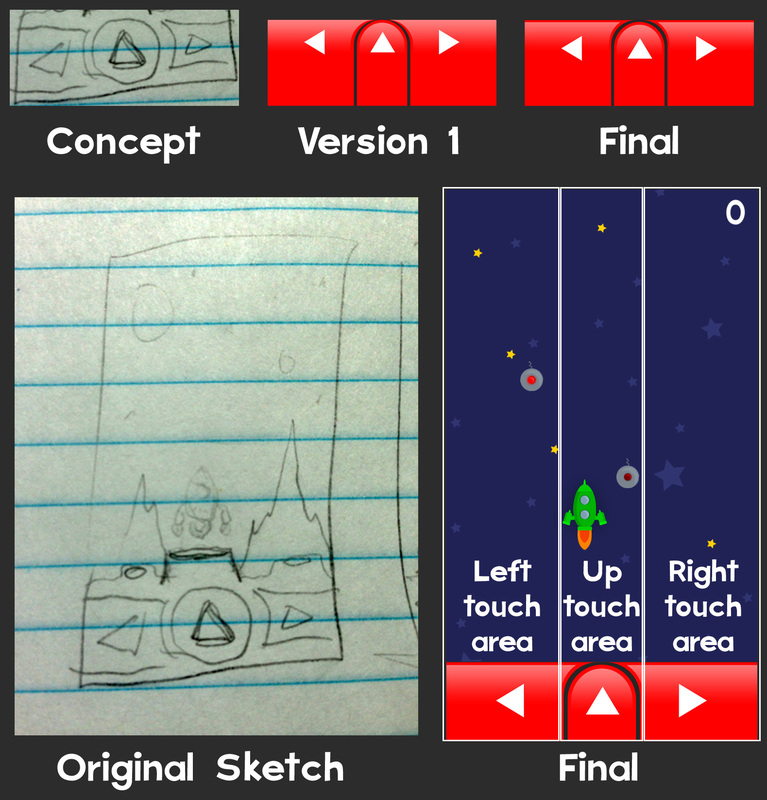 The width and position of the buttons mean that you can control the game without looking at the buttons, removing the no-tactile-button problem which is a common stumbling block when making traditional games for touchscreen interfaces. The center button is skinnier than the others because you use the left and right buttons more frequently than the up thrust. That’s all for the gameplay UI. Next time we’ll probably discuss the actual gameplay control experience. I played Lunar Lander (1979, Atari coin-op) for the first time just a few years ago. It made a big impression on me and ever since, I have wanted to make a game like this. In Lunar Lander, you try to safely land on a craggy planet before running out of fuel by rotating your ship and thrusting in the desired direction. Gravitar focuses on flying through caverns and shooting at targets while saving prisoners. It’s very difficult and even has a level where you fly around a planet with gravity pulling you toward the center of the screen. 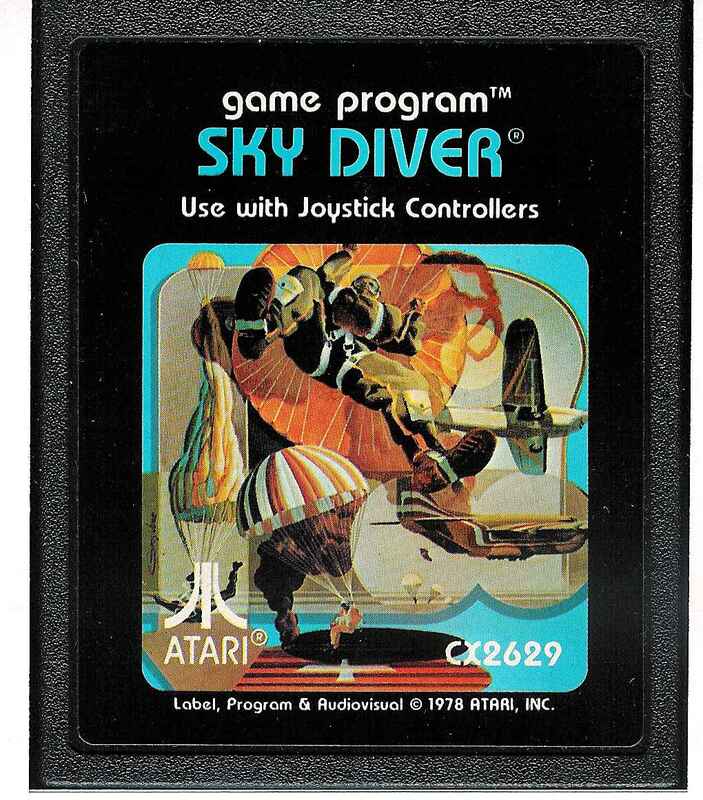 Time your jump out of a moving plane and pull the ripcord before hitting the target in Sky Diver. Points are scored based on the accuracy of your landing. You have limited steering ability once your parachute is open and must take wind speed into account. I love Sub-Terrania! Fly around a map using lander-style controls, shoot enemies and save prisoners-but with a snazzy soundtrack and nice presentation. What does Tappy Lander borrow from these games? The gameplay mechanics. Gravity pulls you down toward the target and you control your ship by thrusting in different directions. You must not hit the landing pad too hard and more points are rewarded for accurate landings. Get bonus points for rescuing floating vegetables, stranded in space. Lots of dodging and maneuvering around traps and obstacles. What does Tappy Lander do differently? There is no fuel to worry about. Fly forever! Controls are simplified: You can only thrust up, left or right. No shooting. It’s all about precision flying. In addition to touching items for points, there are items you must collect to complete a set. More stuff that I’ll talk about in a future post! The next post will probably address controlling the game and UI. See you then!